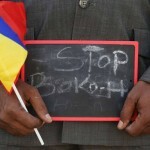 At least 20 of up to 80 people taken hostage by Boko Haram militants in Cameroon at the weekend are reported to be free. Cameroon’s defence ministry said the hostages were freed “as defence forces pursued the attackers who were heading back to Nigeria”. Many of those kidnapped in the cross-border raid were said to be children. It was one of the biggest abductions by Boko Haram outside Nigeria and raised fears that it is expanding its attacks. The militant Islamist group has seized control of towns and villages in north-east Nigeria and has begun threatening neighbouring countries. Chad, which also borders Nigeria, has recently sent soldiers to help Cameroon tackle the militants. On Friday, Ghana’s President John Mahama said African leaders would discuss plans this week to “deal permanently” with Boko Haram, and suggested a multinational force may be considered. Niger and Cameroon have criticised Nigeria for failing to do more to stop Boko Haram’s attacks.